Reviews | Regal Ground Cayenne Pepper - 5 lb. Regal Ground Cayenne Pepper - 5 lb. A key ingredient in hot sauces and great for cooking, Regal ground cayenne pepper will kick up the heat of anything you make! Sometimes labeled as "red pepper," cayenne is ground from a blend of several particularly hot varieties of dried red chili peppers. It has a characteristic bright orange and red color and fine texture. Its extremely hot and pungent flavor will add plenty of zest to barbeque, meat marinades, and buffalo wings! I love using this ground cayenne pepper! It has the best taste and really gives that little extra kick to certain dishes. Always great to have in the pantry! The Regal brand cayenne pepper is the best spice selection for the spicy food my company makes. I have used this product again and again! It was a great price for good quality cayenne. Buy a 5lb container to refill so you can take advantage of Webstaurant's bulk spice pricing. Much fresher and cheaper than what food service distributor charges! Nice spice level and good flavor. We use this in a spicy red sauce for our pizzas. No complaints, a little goes a long way. The Regal ground cayenne pepper has the perfect amount of heat. What can I say, it does the job when it comes to our companies caterings. Little bit of it gives that extra kick to your preparations. Big canister, great price will last a long time. Love the color and the flavor ! Love using cayenne in foods, including some desserts! Quality products are a must for that flavorable pop that makes dishes so tasty and stand out. Mellow yet good flavor of cayenne. More flavor than spice. Definitely does loose it’s kick over time like any other spice. Would definitely purchase again but in a smaller portion. The price of this cayenne pepper compare to the other stores I have looked at beat them all and I was really please that they actually filled up the container! This is spicy! I'm not a huge Cayenne fan but a lot of my recipes call for it. I believe you get the entire tub full of spices for the amount you pay and I would definitely pay for this time and time again! OMG! Bring on the heat! We use the 5 pound Regal Ground Cayenne Pepper on our food truck. Very good quality. Flavor and HEAT are exactly where they are supposed to be. Price for the 5 pound container is on point. If your looking for ground cayenne in bulk then you can't go wrong with the Regal. Will last me a long time. I love that I have found somewhere where I can order in bulk.I use this on a whole lot of things thats why I need items in bulk. I also put this in almost everything i cook. This is a good quality cayenne pepper at a low cost. It is great for chili, meats, spaghetti and many other things. I would recommend it. One of the essential spices to have at the restaurant. We use it for sauces, seasoning and it works great! Also cheaper than anywhere else. The cayenne pepper is marvelous and very fresh quality. An excellent seasoning that is perfect for adding to any dish and is a wonderful buy. This is some great pepper to add to many food dishes although the squirrel's don't like me dusting the ground around my veggie and flower plants. This pepper always helped me out with a missing ingredient and it’s the best for tacos and more, and always buy it because you won’t regret it. A wonderful spice for making our savory jalapeno and cheese cream cheese spread for our bagels. The cayenne pepper is wonderful and very fresh tasting. better prices on spices then any other supplier, and we love the convenient containers. thank you for providing so many different varieties and size options. All of these spices, including this cayenne pepper, from Regal cannot be beat! They are of equal or better quality that most of the private labels, or national brands, and are only a fraction of the price! Regal cayenne pepper is a must have in our catering kitchen. We use it in many recipes, sauces and rubs. This five pound jug is perfect for our needs. Always fresh! Thanks for another great product! A great bulk buy spice that is wonderful in everywhere way possible. Upon arrival, i loved the container and packaging. Great materials and the seal was tight. The cayenne pepper was super fresh and had a delightful smell. A really awesome brand of cayenne pepper that is some of the best we have every cooked with in our kitchen. The spice is great in our meat dishes. The regal ground cayenne pepper is bold and a tad spicy. The bulk tub makes scooping easy and is great for making our dry rub. A great bulk container buy from Regal that is a great quality and perfect for our kitchen. The cayenne pepper is the perfect heat to add to our chili and soups. A nice bold style cayenne pepper that is really spicy. A great way to make our enchiladas and the price is wonderful. A great spice indeed. We go through 10-15lbs. of this cayenne a month with our business and it's always great. It is to be expected that different crops of peppers yield different levels of heat, but overall I would say the average heat of this cayenne pepper is "medium." We love to kick it up a notch in our cooking! We use the Regal ground cayenne pepper on so many of our recipes. With just a pinch the flavors intensify without giving the run for the water heat. It's all about the flavor! Bravo for this product!!! This is a great product. The price is great for the amount. The container fits great on our shelves as well. Just a touch goes a long way. Cayenne pepper in a dish is a great way to add an element of heat or a small bite to the food. A little goes a long way. I will always buy Regal brand ground herbs or spices because the quality is just as good as the bigger name brands at a fraction of the cost. A very nice quality cayenne pepper in a great heavy duty plastic container. It has a great handle for easy handling and large mouth lid for easy scooping. A nice way to kick up dishes. I love cayenne pepper in many dishes. Just a little goes a long way and it's adds a really nice bit of heat to my dishes. A great bold flavor that is awesome for kicking up your meals. The cayenne pepper is nicely ground and adds the needed heat to our gumbo. A great value and very high quality. Cayenne powder sure is spicy! Just a dash will add a nice bit of heat and a good bite to any meal. It's great in soups. I was previously buying several small containers & was constantly running out! It is much cheaper & more convenient buying by the bulk! Great find! This product is truly great. It cost a lot less than buying it through a typical broadliner. If you buy more than one you save on quantity discounts . Regal has a very consistent product and it is great to be able to order the 5 lb. containers vs. the small containers. This is a huge cost savings for us. This is a bright red cayenne and helps lighten our dry rub's color. We also use webstaurant's anchor hocking jar to package the seasoning. Wonderful. Regal Ground Cayenne is essential to our dairy free cheeses, as it adds additional depth of flavor to our products. I am unsure of the heat units in this particular cayenne, but I would say it's a mild or medium heat. Good flavor in our applications, we use 1/16 tsp and it adds just what we need. Price is the best that I've found, like all Regal Spices! Would recommend. Same quality just like the other brands. Worth every money spend in this store. Will definetely buying our spices here. Very Good for restaurant owners. Although I do not know the Scoville units of this cayenne pepper off the top of my head it is a perfect product if you wanted to add a little bit of heat into anything. Shipping fast and cost effective. We us this to make our Italian sausage. It is full of flavor and will pack on the heat. A little bit goes a long way. We use these for our Buffalo Chicken pastelitos. They have a great taste and it's a very good price to buy in bulk. This spice is a staple in our recipe. We chose to go with this over the smaller options we have at our local wholesale clubs and it works just as well. Only difference for me is the price. The value is much better with the Regal brand and the size of this one ensures we won't need to re-order very often. Great buy! Love it! It is used throughout my restaurant. The quality and texture is always the same--5 star! The price is unbeatable! Top notch! I couldn't be happier with this. It always packs the same heat, regardless of when I buy it. It is the same every single time! This is a very fine ground cayenne pepper that we use to bring a little heat to many of our sauces. The 5 lb container makes sure that you won't run out. Cayenne pepper is spicy. I only use a pinch of this at a time so this amount does last quite awhile. I do like to share. It helps to let others know about the Regal foods brand. Regal Ground Cayenne Pepper is Very good Quality. I didn't expect it. I will buy again. Shipping is very fast and package are perfect. Price is very good price too. Wonderfully fresh great bright color,. Added great flavor and heat to tomato sauce for spaghetti squash and in broccoli stirfry. This size is great because it comes with the container to keep it fresh but still has enough to use a lot of it. Cayenne pepper also helps fight illness by helping the immune system and also is a great natural decongestant and expectorant. Using this hot spice also helps increase metabolism. Perfect flavor for any of our spicy dishes! My signature dish actually uses this product, so I am quite the fan! Thanks so much! We love it! Excellent cayenne pepper, the lids works perfectly and it is an easy poor. The shipping was fast and it was packed well. I would highly recommend. The Regal brand cayenne pepper is a great value. The heat seems to be consistent each time I buy it. The product is clean and consistent. The cayenne pepper in the 5lb container is great for a lot of reasons. The quality is very consistent; we've never received a bad batch. The price is great and the container can be re-used or re-filled with bulk purchases. This is a great spice. It lasts a long time and works perfect in my spice mix. It doesn't clump and has very good heat to it! I was very happy to find this in such a big container. I actually use on my outdoor plants to keep the wildlife from eating my pretty blooms. It works pretty well! Very good, but not overly strong, cayenne pepper. I use a touch of it in many items just to enhance the flavor. It's the secret ingredient in my amazing macaroni and cheese and many other dishes I prepare. When this first arrived the container had been damaged in shipping - so cayenne was leaked all over the box. When I sent a photo and discussed with Webstrauntstore.com customer service, a replacement cayenne was sent out immediately. I really appreciate how responsive customer support is. We think this is great quality cayenne and will order it again when it is needed. 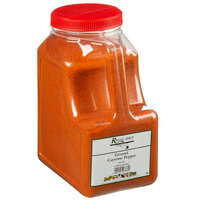 Great item this 5lb Regal Ground Cayenne Pepper, Price really can't be beat and you are getting a good quality product. We will buy this item again. Cayenne pepper is a nice, natural way to help keep ants out of your home. We bought this giant tub of it and sprinkled it around the house. Great price too! This has become my first choice to add spice to pretty much anything, from kimchi to a bowl of chili to a cheese sandwich. Very mild taste, uniform grind and just the right amount of spiciness -- great choice if you're looking to increase heat. We have been using this in numerous rubs, dishes and taco seasonings for quite some time now. People LOVE it! We LOVE it! I highly suggest this brand as it is perfect in taste and color! Great product! My friends and I have been using this delicious cayenne in cooking for ourselves and our families for the last two years and could not be happier with this product. It is extremely healthy for you and adds the "snap" to every dish it is used in. Works great for keeping unwanted critters out of home, yards and gardens, too! Nice size grind, Could be a lil hotter but has a great flavor.Great for those who make their own spice mixes or just cook with a lot of Cayenne pepper. Much less expensive than other stores I've gone to. I cook with a lot of spices, and this is my go-to site to order anything. We use a bit of Cayenne pepper in most of our recipes, but when you add up all the small containers we have to buy a month, buying a 5 lb. container truly saves some money! I go threw alot of cayenne pepper in making my beef jerky. Having it in a 5 lb container is great. I have compared prices and these are the best.. Wonderful spices add great flavors to all my dishes. Can't beat the price for these bulk spices. I will continue to buy my spices here. This cayenne pepper is great for cooking cajun style foods and other dishes! Add some kick to your chili with this regal cayenne pepper seasoning! This is one of my favorite items to stock up on for the restaurant. If you run out at the last minute it costs a fortune to replace at retail. We use ground cayenne almost everyday. With it being in this bulk size, we can order less offen and get a great deal every time we do. Completely Delicious and exactly what I was looking for. Love the bulk sizing that it comes in, as my local "member discount" stores do not sell this in 5lb containers- i will for sure be buying all my seasonings from here again! Thank you!